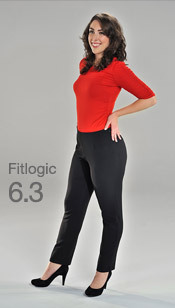 Cricket Lee concepted and developed Fitlogic®, the sizing system that makes the Little Black Pant fit like it was custom-made. Scientifically developed and tested over a 15 year period (she threw out the book on how fashion is currently made and sold), Cricket’s system provides you with a personal two-number decimal system to identify both your size and shape. Knowing your Fitlogic symbol is the key to getting a perfect fit in the Little Black Pant today and many brands in the future. Cricket’s vision is to do away with size in your shopping experience in any brand that licenses it. Natasha Gabrielle Lee created LittleBlackPant to train women as well as the fashion industry to separate fit and style and give women a way to identify their fit for future purchases. 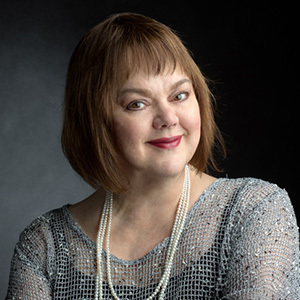 Her merchandising eye is impeccable, and she is setting out to lead the fashion industry in adopting and dressing women with the Fitlogic® technology. Natasha also created the size.shape decimal system as your personal fit identification, which is not only revolutionary but easily identifiable. To contact Natasha or Cricket, please email info@fitlogic.com. We love to hear feedback of any kind. 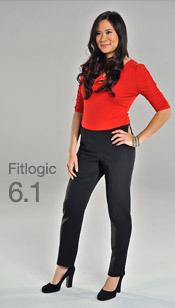 Our goal is to apply the Fitlogic system to your favorite clothing brands. That means you’ll be able to use your Fitlogic Size/Shape icon to get a perfect fit without ever having to try on clothes. For shape 1, the problem is usually that other pants that fit the waist are too big in the hips. For a shape 3, the problem is pants that fit the thighs are about 4 inches too big and too low in the waist. For a shape 1, the problem is other pants that fit the waist are too big in the hips and thighs. For a shape 2, the problem is other pants that fit the hips, are about 2 inches too big in the waist. High hip curve, smaller bottom, and slim or medium thighs? You may be a Shape 1. You are a body shape 1 if your waist is less defined and blends into the hips. You typically gain weight first around your middle. Your hips may extend only slightly, and your bottom is fairly flat instead of round. You may have previously worn a straight type of pant or believe you have more of a boyish figure. Your fullness is carried right under your waist and you may have a tummy. If you look in the mirror, you either have no waist or a very high hip curve about 4” below your waist. Your waist could be larger than your hips. Shape 1 women usually have trouble finding pants that fit because the pants off the rack are too tight in the waist and too full in the backside, legs and hips. Often, pants off the rack fit the waist but are excessively baggy in the rear and thigh. 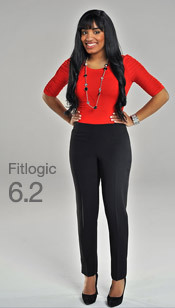 If you have those problems and that describes your body type, a Shape 1 with Fitlogic should give you a comfortable feel and perfect fit. An hourglass shape with a mid-hip curve? You may be a Shape 2. You are a body shape 2 if your waist is noticeably smaller than your hips. This is a classic hourglass shape. You carry fullness along the hip line and at the sides, back or both. Your silhouette becomes smaller from the hips to the knees. You typically gain weight all over or in the hips right at the top of your legs. Shape 2 women usually have trouble finding pants that fit because if the pants fit around the hips, they are usually about an inch too large in the waist. If you have those problems and that describes your body shape, a Shape 2 with Fitlogic should give you a comfortable feel and perfect fit. Smaller waist, abundant bottom & larger thighs? You may be a Shape 3. You are a body shape 3 if your waist is very small in comparison to your hips. You are a pear shape, and you gain weight first in your lower bottom and upper thighs and upper arms. Most of your fullness is carried in your lower bottom and thigh. Your back might have a greater swayed arch, and your thighs are fuller or have a curve at the top of the front area. Shape 3 women usually have trouble finding pants that fit, because if pants fit around the hips, the thigh area is usually too tight and the waist is more likely to be loose (about 3” and dips in the back). 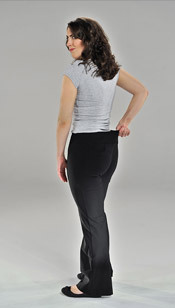 Shape 3 women find that the back waist is too low and the front waist is too high or loose, and usually end up settling for pants that gap in the back, causing their underwear to be exposed when sitting. If you have those problems and that describes your body type, a Shape 3 with Fitlogic should give you a comfortable feel and perfect fit.